On 19th September it will be a year to the day from when I was first diagnosed with a cancer. It's also about 4 months since the scan that showed that my cancer has metastasised, where I moved up to Level 4 and those words 'incurable' and 'terminal' began to apply to me. As you can imagine it's been a year of immense learning. I've learned a lot about cancer. I've learned a lot about the warmth of people, and what friendship and family really means. I remember the confusion I felt on the first night I spent on the Surgical ward. Apart from the aches that had taken me to the GP's that evening, I felt pretty well. Everyone else on the ward looked to be in terrible distress. All round me were people vomiting green bile, people clearly in agony. I felt like an intruder. It's a feeling I still have a lot of the time, because apart from pain, my operation scars and my stoma, there's nothing tangible that tells me I have cancer. In the last few weeks a lot of things have been falling into place. I've moved off codeine, which I really disliked because it made me twitchy and anxious, onto morphine, which is controlling my pain much better. I have a MacMillan nurse who is giving me good advice around pain. I'll be discussing end of life planning with her next week. I'm working things out so that I can keep on at work. I have had a scan that shows that while the nodules are still growing, the rate of growth has been considerably slowed down by the chemo. I would have hoped for shrinkage, but I'm told very slow growth is almost as good. I've also read Serwan-Schreiber's book 'Anti-Cancer'. This has inspired me to take diet and exercise much more seriously. According to the stats I've read, 12 out of every 100 men with bowel cancer that has metastasised are still alive five years after diagnosis. I have every intention of being one of those 12, but I also need to plan in case I'm one of the 88. Eating well, including things like turmeric, ginger, garlic, fresh fruit, vegetables and green tea in my diet has already improved how well I feel, and I'm certainly enjoying the taste of my food more than when I was following the advice of the stoma nurses to 'eat plenty of stodge'. Last Saturday I attended Preston's 'Gentle Approach to Cancer' group, and enjoyed my first ever yoga session, which was also the first formal set of exercises I've participated in since my operation. Moving in this way, even once has boosted my physical confidence and made me feel better in my own body. It was great to meet people who are living with cancer, to hear their stories and basically be with people I don't need to explain everything to. We sung the song I've posted in the photo together. 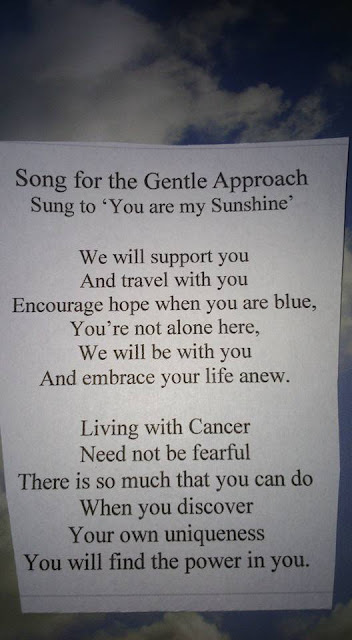 In general I find great support from groups of people with experience of cancer in their own lives, like this group, and like the online forums that exist. Nothing beats lived experience. I also want to plug my mate Ben Ashworth. He has bowel cancer too, lives round the corner from me and has run 17 marathons in 17 months. He is raising enormous sums for charities. He's a personal hero of mine. He's been living the bowel cancer adventure for about a year longer than me, and is just a wonderful individual. My message to people newly prescribed with a cancer, or who have just discovered that their cancer has metastasised is "don't panic". Keep going. Find strength in other people, particularly people who are living with cancer themselves. Find little ways to win more control. Take one day at a time, days turn into weeks, weeks turn into years. The survival stats for men with a Level 4 metastatic bowel cancer don't look brilliant. Something like 7 in every 100 live for more than 5 years. One question to ask is "why shouldn't I be one of those 7?" another is "What do I need to do so that I have a good life for as long as I can, what do I need to do to make sure my family are OK in case I am one of the 93?" I blogged my journey with liver cancer and a transplant, but I kept it to myself as a journal until after my surgery. I finally released it to immediate family and a few friends. If I encounter chronic illness yet again, I hope I have the courage you've shown and just put it our there.